Over 3,500 police officers and traffic assistants patrolled over 360 schools and kindergartens around the city this morning on the first day of the new semester. Yao Hongmin, a police officer from Wujiaochang Police Station, Yangpu District, joins his colleagues from the traffic police in helping kids from Wujiaochang Kindergarten safely attend the first day of the new semester on Friday morning. 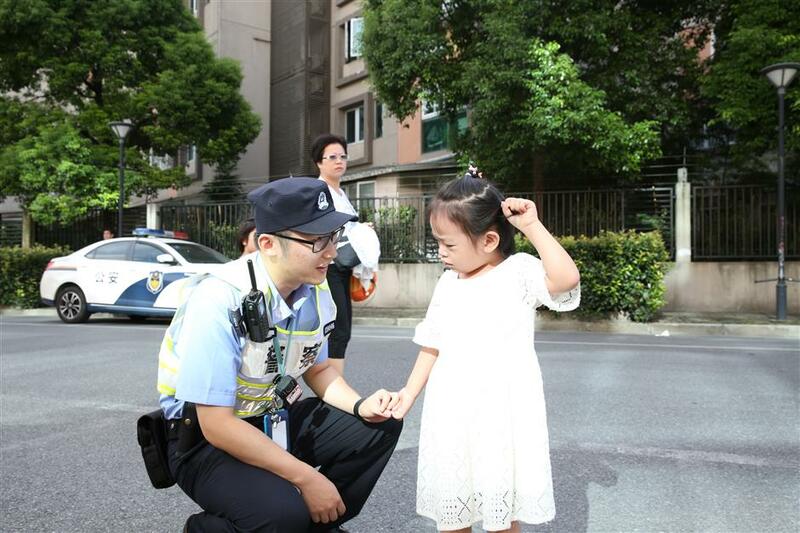 Shanghai traffic police announced the start of a campaign around the city’s middle schools, primary schools and kindergartens in the next few weeks to crack down on traffic offenses. More law enforcers and traffic assistants will be assigned to streets around the schools and kindergartens where traffic offenses often happen, especially targeting offenses such as speeding, running red lights, illegal parking and not properly giving way to pedestrians on zebra crossings, police said. Shared bike companies will also be asked to step up efforts to remove illegally parked or disarrayed bikes outside the schools. Meanwhile, a citywide crackdown on school bus traffic offenses will be looking out for offenses including overloading, not driving along approved routes, speeding, and drivers and passengers not wearing seat belts, according to the police.